Apple has re-engineered the Mac mini (Late 2018) to drive tasks ranging from home automation to giant render farms, Xcode servers, industrial-grade tasks, live concert sound engines, digital art and signage, testing iOS apps, and more. Upgraded with an 8th Generation Intel Core processor, the Mac mini features a more efficient thermal architecture, all-flash storage, a bigger fan, expanded vents, a redesigned power supply, and Apple's T2 security chip. This Mac mini is powered by an 8th Gen Coffee Lake 3.2 GHz Intel Core i7 Six-Core processor that features a burst speed of up to 4.6 GHz, while 8GB of 2666 MHz DDR4 RAM helps to ensure smooth multitasking and also allows the computer to quickly access frequently used files and programs. The system memory can be upgraded to a maximum of 64GB. Integrated Intel UHD Graphics 630 delivers a sharp, clear picture, and you'll be able to output video to an external display using the system's Thunderbolt 3 ports, which feature native DisplayPort output, or use the built-in HDMI 2.0 port. Up to three 4K displays are supported between any two Thunderbolt 3 ports and the HDMI port or you can connect one 5K display and one 4K display. For storage of your files, this Mac mini is equipped with a 1TB PCIe SSD that has a sequential read speed of up to 3.4 GB/s. If you want to add external peripherals, four Thunderbolt 3 ports support bi-directional transfer speeds of up to 40 Gb/s, while also supporting 10 Gb/s USB 3.1 Gen 2 (USB 3.1), device charging, and an external GPU. Thanks to two 5 Gb/s USB 3.1 Gen 1 (USB 3.0) Type-A ports, you'll still be able to connect other devices to this system. 10 Gigabit Ethernet is built in for wired networking, or use dual-band Wi-Fi 5 (802.11ac) for wireless networking. Bluetooth 5.0 technology will allow you to connect additional compatible peripherals, including keyboards, mice, and headsets. Sound is output using a 3.5mm headphone jack. Apple's Mac mini (Late 2018) operates using an internal 150W power supply that runs off 100-240 VAC at 50 to 60 Hz. In addition to being a great desktop computer, the Mac mini powers everything from home automation to giant render farms. And now, with an 8th Generation 3.2 GHz Intel Core i7 Six-Core processor and Intel UHD Graphics 630, the Mac mini has even more computing power for industrial-grade tasks. So, whether you're running a live concert sound engine or testing your latest iOS app, the Mac mini is the shortest distance between a great idea and a great result. The Mac mini features 8GB of high-performance 2666 MHz DDR4 SO-DIMM memory for faster rendering, working with massive files, or running multiple virtual machines. And now you can configure even more memory - up to 64GB - to run even heavier workloads. This Mac mini has a 1TB PCIe SSD with sequential read speeds of up to 3.4 GB/s, so you can load giant files and launch apps quickly. The Mac mini features the Apple T2 Security Chip, a second-generation custom Mac silicon designed by Apple to make the Mac mini even more secure. The T2 Security Chip consolidates several controllers into one, and includes a Secure Enclave co-processor that provides the foundation for encrypted storage and secure boot capabilities. The Mac mini is optimized for performance across the board, with programs including Xcode, WebKit Compile, Adobe Photoshop CC, Pixelmator Pro, Luxion KeyShot, Autodesk Maya, Compressor, Final Cut Pro X, Logic Pro X, MainStage, Rise of the Tomb Raider, and more. With a variety of ports, the Mac mini is ready for a variety of workflow configurations. Thunderbolt 3 is powerful and versatile, and the Mac mini has four of them. The HDMI 2.0 port delivers more bandwidth than its predecessor, so you can enjoy faster frame rates. For wired network access, take advantage of the integrated 10 Gigabit Ethernet port. Thunderbolt 3 gives you some productive possibilities. Transfer data at up to 40 Gb/s, charge and power external devices, connect up to two 4K displays—and even a third with HDMI 2.0—or one 5K display. Or, pair your Mac mini with an eGPU for desktop-class graphics performance. Your Mac mini comes with 90 days of complimentary technical support and a limited 1-year warranty. Purchase AppleCare+ for Mac to extend your coverage to three years from your AppleCare+ purchase date and add up to two incidents of accidental damage coverage, each subject to a service fee of $99 for screen damage or external enclosure damage, or $299 for other repairable damage, plus applicable tax. Because of its size, performance, and wide array of ports, the Mac mini goes where no Mac has gone before. And now, with even more cores packed into its 7.7" square frame, you never know where you'll find a Mac mini—or dozens of them—hard at work. The faster 2666 MHz DDR4 memory in the Mac mini is ideal for batching out massive Xcode builds or rendering and compressing video. A 3.2 GHz Intel Core i7 Six-Core processor and fast I/O connectivity make the Mac mini a solid Xcode companion to build your apps quickly while running automated tests in the background. With its 1TB PCIe SSD, fast performance, and small footprint, Mac mini becomes a live musical instrument with MainStage on some of the world's largest concert tours. From performance art to immersive digital billboards, the Mac mini drives some of the biggest and brightest digital displays with its powerful processor, high-performance memory, and fast, versatile I/O. macOS Mojave features Dark Mode, pro-inspired features, four new apps, and a redesigned Mac App Store. Two displays with a 4096 x 2304 resolution at 60 Hz connected via Thunderbolt 3, plus one display with 4096 x 2160 resolution at 60 Hz, connected via HDMI 2.0. One display with a 5120 x 2880 resolution at 60 Hz connected via Thunderbolt 3, plus one display with 4096 x 2160 resolution at 60 Hz, connected via HDMI 2.0. Native DisplayPort output over USB Type-C, with Thunderbolt 2, DVI, and VGA output supported using separately-sold adapters. Support for one display with a 4096 x 2160 resolution of 60 Hz with DVI output using a separately-sold HDMI to DVI adapter. 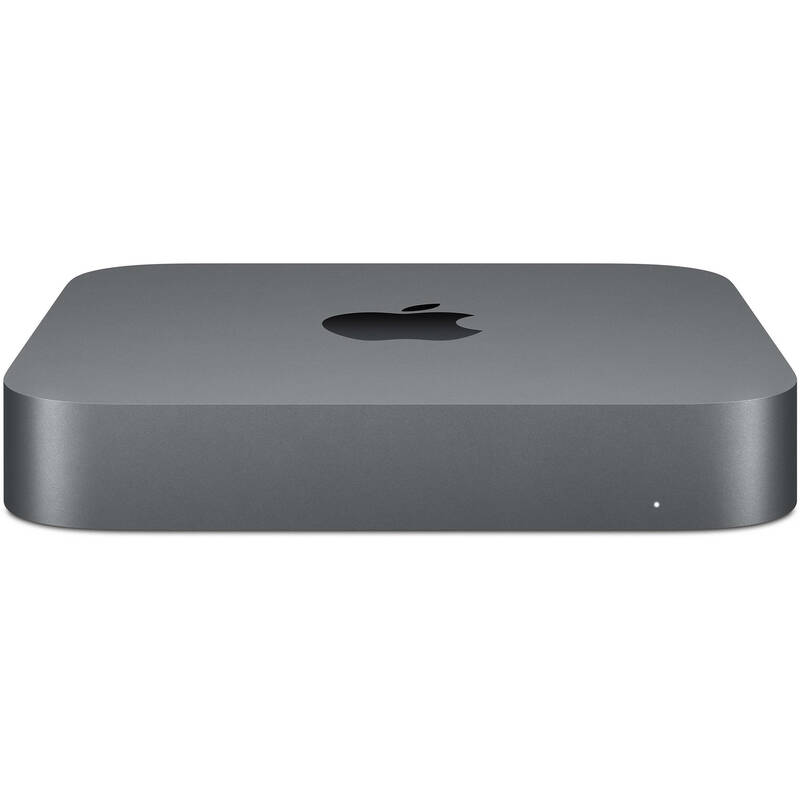 Box Dimensions (LxWxH) 10.25 x 10.25 x 4.5"
Mac mini (Late 2018) is rated 4.6 out of 5 by 99. Rated 5 out of 5 by Chris from GREAT COMPUTER I Bought this computer to work with multiple software instruments at the same time in my DAW (primarily Apples MainStage 3) and it absolutely smokes other top of the line MacBook Pros Ive had in the past. I bought this computer with 8GB of memory on purpose and bought 32GB of memory from BH at the same time. Super easy to install (although you DO need to buy a SAFETY hex screwdriver set - cheap on amazon but NOT in your local hardware store. SAFETY hex screwdrivers have a pinpoint in the middle of the driver to work with safety hex screws and regular hex, star, or Allen keys will not work). Once the 32GB of RAM was installed the computer was unstoppable! Rated 2 out of 5 by Andrew from Less is not more 1) No more SD Card Reader. I dont know about others, but I use lots of them, and I need to read them into my machine. External adapters/readers are a pain. 2) Fewer USB ports. Who needs 4 Thunderbolt ports? Theres nothing to hook up to them. And if you do have more, you can daisy-chain them. I need USB ports. Almost Everything I have runs on it. Two ports just doesnt cut it. 3) No more Audio-In jack. What were they thinking? 4) No more Firewire port. I still have gear that runs on it. I need it. To wrap up: Were getting less connectivity, less flexibility, for a lot more money. Thats the kind of economics that will drive us bankrupt. Thanks, Apple. Rated 5 out of 5 by christopher from Worth the wait, its everything Id hoped for. Been a long time coming, was looking for a general purpose/media machine and was about to pull the tigger on a NUC until I heard about the new Mac minis. I like to listen to music and watch movies at night with headphones and had been using my pc workstation for that purpose and was annoyed with the fan noise it made when running and now its so quiet with the Mac mini and it makes listening much more enjoyable especially with open-back headphones. The only way I can tell its even on is the tiny light at the front. This is simply a great update from Apple and I love it. Rated 5 out of 5 by Noel from Nice Mac Bought this Mac Mini to learn macOS. New to Mac and have never used one before (have always been a Windows PC user). Bought the Mac Mini with Intel i5 Six Core processor, and paired it with a 32 LG 4K display. So far so good! Impressive speed and ease of use. Easy to set up and very quiet machine. Comes with Mojave OS, which I just manually updated after powering on the machine and registering for the first time. YouTube and Netflix 4K videos looked awesome! B&H shipping is quick and Free - Im in California and I received my Mac in 3 days! Highly recommended especially if you are on a budget but want a good Mac to use and learn. Rated 3 out of 5 by James from External Disks automatically Eject improperly : ( The Mac mini is (2018) s everything I needed except one major flaw. Like many Mac mini owners, I need to use the external ports (thunderbolt 3 and USB) to connect external storage drives. Macs randomly eject external drives and Ive experienced it with multiple drives, different manufacturers, on both port types (TB3/SB), with multiple cables. I suggest you search error disk not ejected properly for macOS as you decide on whether or not to purchase a Mac mini. Up until now Apple has been able to ignore the issue because other Mac products rely on internal storage. However, now that the Mac mini more heavily depends on external drives, it could be a serious problem for productivity. Other than this issue, the Mac mini is everything I want it to be. Small, quiet, powerful and able to use external monitors, mouse, etc. I like the Mac mini product very much, and I want t love it, but am sad about the disk eject problem. Wish I knew ahead of time. Now you do. Rated 5 out of 5 by Malcolm from Works perfectly Fairly easy to set up and transfer data from old Mac to the new Mac. only problem was that a couple of my old apps were no longer compatible with the newer operating system on the new Mac so I had to re-purchase the up to date versions on a couple of my apps. Also transferring the email app was easy but I had to re-enter the settings on the new Mac for the email to work. Apple Support was helpful and quick in getting that set-up for me in a short phone call. This Mac Mini is wonderfully fast and easy to use. As a photographer I use Photoshop a lot and the graphics software in the computer are totally up to the standard I require for my professional work. Rated 5 out of 5 by Tony from Worth the wait, more than meet our needs My wife and I replaced our aging MacPro computers with Mac Minis. They were very easy to setup and configure. They are absolutely quiet and draw far less power than the old MacPro computers. While Ill miss being able to update the computers as I did both of the old systems, Im finding as I age Id rather buy up, meaning buy more than I need now, to avoid having to heft, open, install, and configure new hardware. macOS 10.14 also was easy to bring our old setups forward. If youre thinking of a new computer, keep the Mini in mind. It may just surprise you. Rated 5 out of 5 by John from A Great Update I replaced a 2010 Mac Mini with this newer model. I am not a demanding user, just some email, WP, and related tasks. It fulfills all of those, and uses my Apple Cinema Display with just minor adaptation needed. I see that another reviewed decried some of the choices Apple made about input ports. I already used the Cinema displays USB ports, and put in a Belkin 7-port USB hub for other things. For me its fine, but for others...maybe not so. In any case, its great for my simplified uses, and its a vast improvement over the 2010 version I own. Is software for photos, imovie, GarageBand,pages, Numbers &amp; keynote included? Yes those programs would be included. Would i be able to transfer from my information iMac to the mini? Yes. Apple has a migration system built into Mac OS that allows you to transfer files, apps etc. between two macs. Apple has great guide on how to do this. https://support.apple.com/en-us/HT204350. is RAM user upgradable after purchase? Yes, the RAM is user upgradable after purchase. Is the headphone jack compatible with gaming headsets for both audio input and output? Yes, the headphone jack on the Apple Mac mini (Late 2018) B&amp;H # APMRTR2LLA supports headsets with a single TRRS 3.5mm connector. The SSD on the Apple Mac mini (Late 2018) is not upgradeable post purchase so it is important that you buy it with the storage necessary for your personal workflow. The RAM is upgradeable post purchase up to 64GB using DDR4 2666Mhz 260 Pin SO-DIMM modules. Will you have the option to upgrade to 10 Gigabit ethernet? I'd rather buy form you than Apple but they have the options whereas you currently don't. Thanks.